I’ve caught the madness. The popsicle making madness that seems to be going around. I suppose it’s about time I caved to pressure. I never did make French macaroons. I couldn’t help it with popsicles though. There are so many fun shapes and flavors to mix together. Then there’s new potential to use leftover fruit sitting around in my fridge. 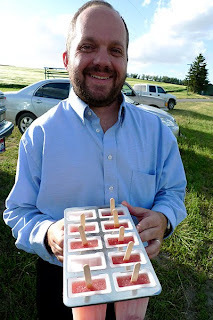 I had so much extra watermelon I got to give watermelon pops a couple tries before I found one I really love. This is the one! They taste like icy watermelon on steroids. Floral and flavorful. Sometimes, if you’re lucky like I am, watermelon popsicles arrive by pickup truck to a sweltering farm by a really sweet husband. Then you get to share your creation with your classmates and take a break from hoeing up weeds and building hoop structures. You’ll need a fine mesh strainer and a blender for this one. Blend together watermelon chunks, sugar and salt. Taste for sugar adding more if needed. Press the mixture with the back of a spoon through a fine mesh strainer into a 4 cup measuring cup or bowl leaving behind the pulp. Stir in Watermelon Pucker and Chambord. Pour the mixture into molds and freeze. Run molds over hot water to remove popsicles. Recipe and photographs by Laura Flowers. Laura...you have me sold. 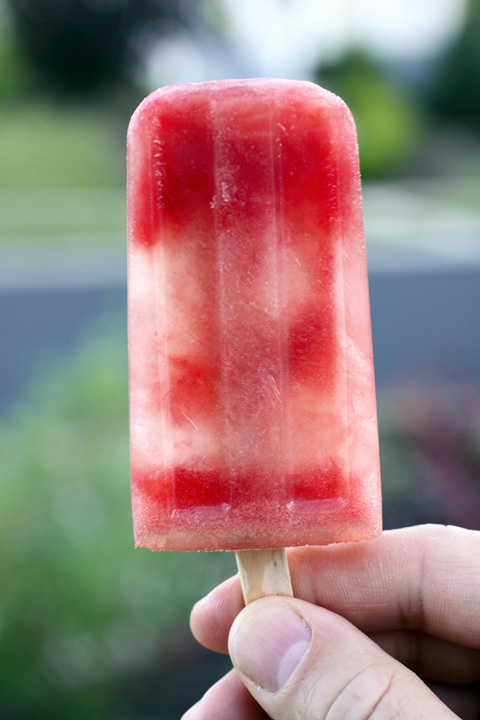 Watermelon pops with a dash of liqueur...how could I say no? I don't think you can go wrong with "boozy" watermelon ;o) Sounds delicious and refreshing! GASP! Do these look heavenly......ice cold watermelon on steroids......... Ohhhh yeah!!!!! Pass the pops please! Fabulous, but then I expect(and am never disappointed)the best when i come here. I love your blog. The chambord makes this an inspired treat... on a day like today I need all the refreshment I can get! Love the boozed up popsicles!! Have a great weekend! Thank you for the tip on removing the popsicles! I made some before and couldn't get the darn things out! Your popsicles look amazing! YUM! Did you realize that your last three recipes posts include alcohol? Do I need to stage an intervention here, Laura? LOL! You know I'm just teasing but I did find that funny. And I'm having fun imagining what you're doing with the leftover alcohol. The only time I've ever been drunk in my life was off of Apple Pucker. Pucker is yummy! I think I would love these and how sweet of Jamie to bring them out to you (I'm suddenly horrified that I might have gotten his name wrong--is that right? We haven't talked in so long I think I may have forgotten your hubby's name--I miss you on m/s!!!). Having fun with this organic farming stuff? I know V. I thought about that too lol. I go on food tangents and just can’t help myself! I need to find balance. Maybe I need an ingredient intervention! Oh this is so smart and fun!!! Love the idea, perfect for summer! Ooo I love it. An adult version of popsicles. We can't seem to get enough of them at my house! Oh yum. This reminds me of Sweet Paul's post about just plugging a bottle of vodka into a whole in a watermelon and spiking it that way. This looks cuter and more friendly to alkie lightweights like myself. Kentucky Pecan Pie, Another Dishboy Takeover.